Guinness, the famous stout with a creamy head, will no longer be made in London after the summer of 2005. Drinks giant Diageo will close its Park Royal brewery and transfer production for the UK, its largest market, to the St James's Gate site in Dublin. The closure of the London brewery, which started work in 1936, is expected to cost about 90 jobs. Diageo said drinking habits have changed in the British market, leaving it with excess capacity. 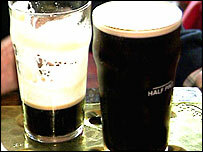 The UK is still the largest market in the world for Guinness, where the drink is the fifth best selling beer or stout. But the drink's popularity does appear to be weakening. Sales declined in the last six months of 2003 with volumes down 3% compared to the same period a year earlier. In Ireland, its ancestral home, sales have fallen 7% in the same period. Diageo said it would increase the volume of Guinness produced in Dublin by 50% and invest a minimum of £15m ($27.7m) in the St James's Gate brewery. Historically, the famous stout has an image which goes beyond the drinks market. Guinness ran a famous "Guinness is good for you" advertising campaign in the 1920s. The slogan allegedly stemmed from market research: people had told the company that they felt good after their pint. In England, post-operative patients used to be given Guinness, as were blood donors, because of its high iron content. In today's highly competitive UK market, the drink competes with Carling, Fosters, Stella Artois and Carlsberg for top brand sales and is ahead of John Smiths and Kronenbourg 1664.